Search scientific abstracts for genes, proteins, target chemical compounds, or interesting conditions. Get visualizations of relevant articles. Discover a network of relationships between drugs, targets, and diseases including sentence-level evidence supporting the connections. In early research stages, discover affinities between entities. Affinities are based on the statistical significance of the frequency with which different entities are mentioned in the same text. Discover a network of similarities between two sets of biological or chemical entities using semantic fingerprinting. Explore predictions for new entity relationships by applying predictive algorithms to existing relationship networks. Find chemical compounds that are the same or similar to a compound that you specify by drug name, chemical composition, or molecular structure. Find post translational modification (PTM) events that act on the protein you specify, and view the amino acid location on the protein where the events occur. Barrow began working with IBM to explore unidentified genes and proteins that may be linked to ALS using its life sciences solution, Watson for Drug Discovery. In collaboration with the Barrow Neurological Institute, Dr. Robert Bowser and his team of researchers used Watson for Drug Discovery to help identify new targets for ALS research. By partnering with IBM’s Watson for Drug Discovery, Pfizer hopes to more quickly analyze and test hypotheses from “massive volumes of disparate data sources”. 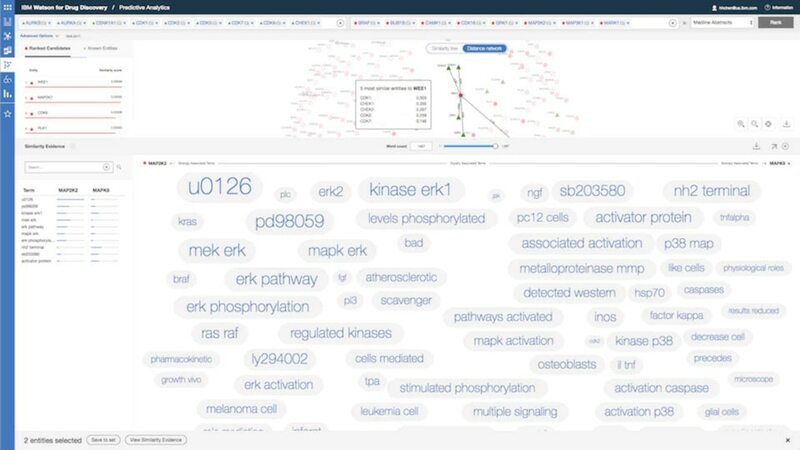 Pfizer is one of the first organizations worldwide to deploy Watson for Drug Discovery – tapping in to Watson’s machine learning, natural language processing, and other cognitive reasoning technologies.